This book broke my heart. And it made me feel so whole. I love that this is a duology, even though I adored these characters and the world and I didn’t want to leave them, it just kind of works. And as excited as I am to hear about King of Scars, this duology is just perfect as it is. Yay for duologies. I’ve always said the hardest books to review are the ones you loved the most, and I am completely standing by that sentence right now. This book was set in a magical world, with beautiful words and in depth characters. I just can’t match up to that. Just going to give a little shoutout to Emma, who inspires me so much and who wrote a review I love. I wish I could be that good with words! I’m shocked at how much I enjoyed this book compared to Six of Crows. I’m not saying it was bad – far from it – but I just enjoyed this book so much more. Maybe it’s because I now class myself as a fantasy reader, and with every fantasy book I love I find the gateway to the genre open a little more. 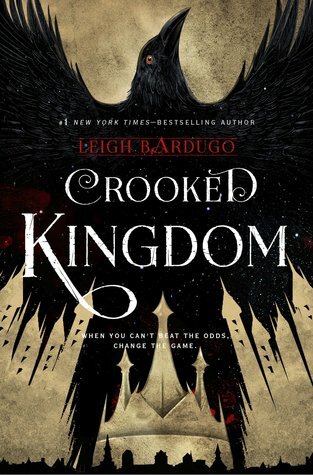 Maybe I enjoyed it more because we explored much more of the world in Crooked Kingdom, and I love how the book followed a number of locations. And can we just talk for a minute about character development. Hell, I have never seen an author define their characters so well. I felt so close to each of the 6 POV, and I think that’s so rare in YA, to know exactly how each character is feeling in relation to the whole story and each separate character. To see the differences and definition in each beautiful soul and exactly how they work together like clockwork is so impressive. I might not be the best with words in these situations, but I do want to say something. This book shines. It is a rarity. It is 3D in a world of 2D. It is a, simply, an absolute gem. And if you love fantasy, please, I beg you, go and read this series. Ah, the series that inspired me to ink my thigh 😀 I will forever love Leigh’s work, regardless of what it is. Ohh what did you get tattooed?